THE place to go for Sunday Lunch. A family friendly Bar with great pub grub. Seating indoors and out. Major sporting events shown in high definition – multiple TVs. A free pool table, dart boards. 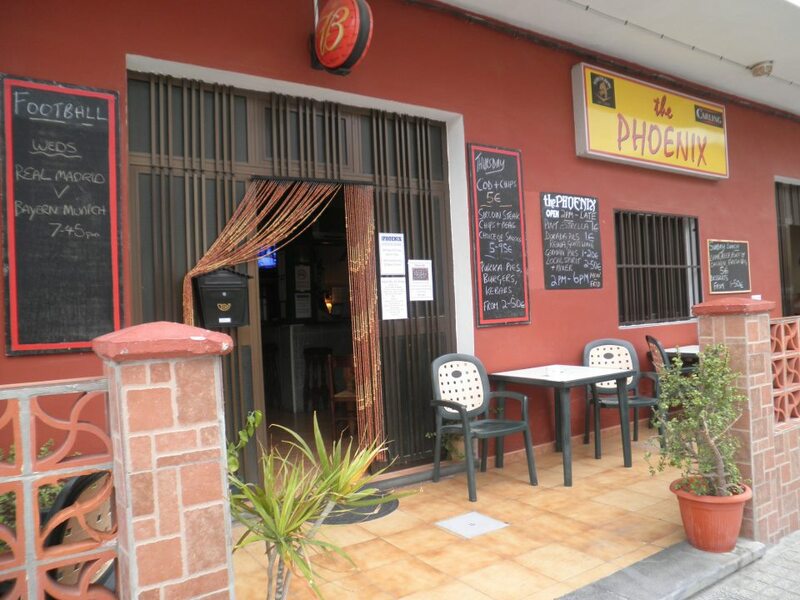 Recomendation posted on the Tenerife Forum by Mary Ann: The phoenix bar is just a 5 minute walk from the harbour towards el medano. if you stay on the main road and go from the roundabout, keep walking until you come to a supermarket called dia. turn right, go to the end of the road and the phoenix bar is right in front of you. Or you can walk down to the bottom of the harbour and follow the paved area through a wide gap in the buildings, go up the steps and go through a narrow alleyway (it looks like someones back yard). it then widens out to the road that follows the sea front, keep going until you come to a viewing area with some steel windmills. the phoenix bar is on the corner opposite the viewing area. Yes, the dinners are very good and drinks are cheap. 1,20 a bottle of dorada, 1,60 a glass of house wine, 2,20 local gin and tonic! The phoenix is more like a traditional british pub with a very friendly atmosphere and personal service. Also, you would have to travel a long way to find fish and chips as good as theirs (not on sundays though). I live locally and have been eating and drinking in the phoenix for a few years now and can highly recommend it.